Gethin presented five series of Popty on Welsh Channel S4C from 2000-2003. He then went on to present the channels flagship youth magazine show called Uned 5 for 2 ½ years from 2002. He also presented Y Briodas Fawr (the big wedding) and Jones Jones Jones at Cardiff’s Millennium Centre (in both English and Welsh) where the world record was broken for the biggest gathering of people with the same surname! He’s also presented numerous live OB’s for S4C and the BBC. Whilst on Uned 5, he obtained a Private Pilots’ Licence as part of a filming challenge lasting over 8 months.Gethin presented Blue Peter for 3 ½ years before leaving CBBC’s flagship show in June 2008. His time on Blue Peter saw him take on the most extreme, wonderful, scary and strangest challenges of his life. He flew with the Red Arrows and in a WW2 Spitfire. He’s been attacked by an alligator in Louisiana, ridden the highest, fastest, tallest rollercoaster’s in the world (he hates them! ), was the first person to light a candle at Elvis’s vigil to celebrate the 29th Anniversary of his death, performed the Canterville Ghost with the English National Ballet in front of 2,000 people. Skated the infamous Cresta Run in St Moritz. Fought as a Samurai Warrior in Japan. But his biggest moment was when he became the first civilian (and Blue Peter presenter) to finish the Royal Marine Commando 30 mile Yomp - he finished in a time of 8hrs 20mins… in about 7 pieces! He was also a semi-finalist in BBC1’s Strictly Come Dancing 2007. His 2008 projects included presenting a Police Camera Action special for ITV1, Gethin Jones’ Danger Hunters for Virgin1 where he chased deadly weather around the world. E24, a weekly News Entertainment/Showbiz round-up for BBC News. 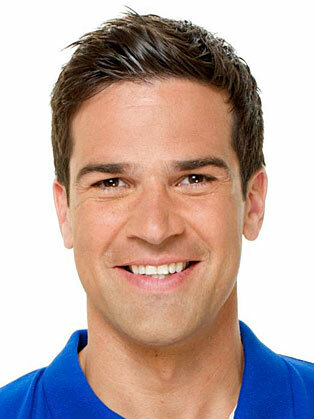 The Gethin Jones Show Saturday and Sunday mornings on Radio 5 Live. Gethin also narrated and presented BBC’s Young Musician of the Year, live at Cardiff’s Millennium Centre.January and February 2009 - Gethin took to the dance floor one again, touring Nationwide with the Strictly Come Dancing arena tour. In 2009, Gethin hosted a new game show ‘Sell Me The Answer’ for Sky1. The 50-show run started to transmit in November. He also presented his own Saturday morning show for 13 weeks over the Summer on Radio 5 Live. In August, co-presented a week of The One Show for BBC1.He also presented shows for the National Lottery on BBC1 throughout the year.Christmas 2009 saw Gethin star in his first pantomime ‘Cinderella’ in Guildford, playing Prince Charming. After this run ended in January 2010, he hosted the Golden Globes red carpet coverage for Sky1. 2010 was a busy year for Gethin; he took part in Soccer Aid for ITV1 playing for the Rest of The World Team, at the end of July hosted the new ITV1 series of Police Camera Action and returned to Radio 5 Live with his own Saturday show from July, running for 7 weeks. He also hosted 71 Degrees North for ITV1 which transmitted from September. He also returned to Wales in September for a week long run in the musical Rocky Horror Show, acting as the Narrator. 2011 saw Gethin hosting two new shows for ITV1; Holding Out For a Hero and Adventurers Guide to Britain. In November, he hosted a series of programmes on BBC1 daytime for Remembrance Week, and launched the Royal British Legion’s Poppy Appeal for 2011. During the 2011 Rugby World Cup, Gethin hosted his own live radio show for Real Radio Wales. He is also the face of Holland & Barrett, the UK’s leading retailer of vitamins and mineral supplements. Summer 2012 saw Gethin feature in ITV1’s primetime series ‘Britain’s Secret Treasures’ and sees him continue his relationship with Sky’s multimedia cycling initiative ‘Skyride’, which aims to encourage the nation to get on their bikes and enjoy the benefits of biking. In November 2012, Gethin returned to Afghanistan to front BBC One’s moving series of programmes honouring Remembrance Week. Gethin can be seen as a regular face on ITV1’s flagship breakfast programme Daybreak as Features Reporter for the show, and recently travelled to Nepal in early 2013 to front BBC ONE’s monthly charity appeal strand ‘Lifeline’ for Renewable World, a small charity tackling poverty and environmental issues worldwide through renewable energy for small communities. He also recently fronted BBC Daytime police-access show, Robbed, Raided, Reunited (BBC1, June 2013) and took viewers of ITV1’s Britain’s Secret Homes on a stunning journey from Wales to the heart of Patagonia.